Check the electrolyte quantity of each cell (maintenance–free battery). If under the lower level, replace the battery (or add distilled water if possible) and check the charging system. check the electrolyte quantity of each cell (except maintenance–free battery). If under the lower level, add distilled water. Check the specific gravity of each cell. : if the specific gravity is less than specification, charge the battery. After having driven the vehicle and in the case that 20 minutes have not passed after having stopped the engine, turn the ignition switch on and turn on the electrical system (headlight, blower motor, rear defogger etc.) For 60 seconds to remove the surface charge. turn the ignition switch off and turn off the electrical systems. measure the battery voltage between the negative (–) and positive (+) terminals of the battery. : if the voltage is less than specification, charge the battery. Check the indicator as shown in the illustration. check the fusible link, h–fuses and fuses for continuity. Cracks on the rib side of a belt are considered acceptable. If the belt has chunks missing from the ribs, it should be replaced. Check that it fits properly in the ribbed grooves. : check with your hand to confirm that the belt has not slipped out of the groove on the bottom of the pulley. turn the ignition switch on. Check that the charge warning light comes on. start the engine. Check that the light goes off. : if the light does not operate as specified, troubleshoot the charge warning light circuit. if a battery/alternator tester is available, connect the tester to the charging circuit as permanufacturer’s instructions. If a tester is not available, connect a voltmeter to the charging circuit as follows. 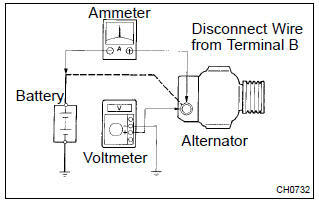 Disconnect to the wire from terminal b of the alternator and connect it to the negative (–) lead of the ammeter. Connect the positive (+) lead of the ammeter to terminal b of the alternator. Connect the positive (+) lead of the voltmeter to terminal b of the alternator. Ground the negative (–) lead of the voltmeter. Check the charging circuit (denso made). With the engine running from idle to 2,000 rpm, check the reading on the ammeter and voltmeter. with the engine running at 2,000 rpm, turn on the high beam headlights and place the heater blower switch at ”hi”. check the reading on the ammeter. if the ammeter reading is less than standard amperage, repair the alternator. If the battery is fully charged, the indication will sometimes be less than standard amperage.